Those of you who follow me on Facebook and Instagram would know that, a few weeks ago, I traveled to Switzerland to spend some quality time with my brother. Adit took the whole week off and we did a lot of fun stuff, much of it centering around food. I’ve been meaning to do a round-up here but you know how it goes! 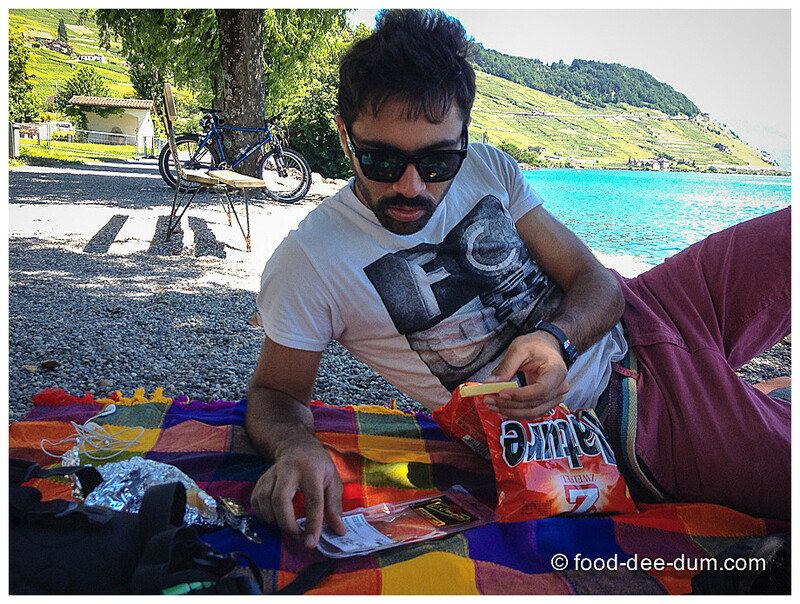 There were 2 major food-related-trips that we took within Switzerland so each of them is definitely getting a post of their own. The rest (city stuff) can all go together! So watch this space for all of them! 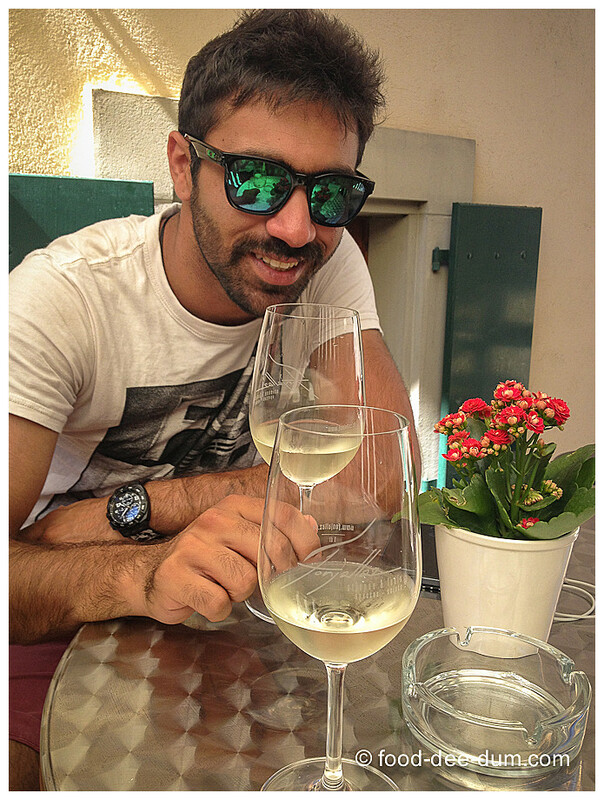 Adit lives in a town called Lausanne, which is a 45 minute train ride from Geneva Airport. It’s claim to fame is that it is the Olympic Capital. It also has a pretty large university so the average age in the town is pretty low! Instead of traveling to Barcelona and/or Nice, as we had originally planned, we decided to do a few circuits in Switzerland – a few days off-Interlaken and day trips to the Swiss Riviera and Gruyeres. 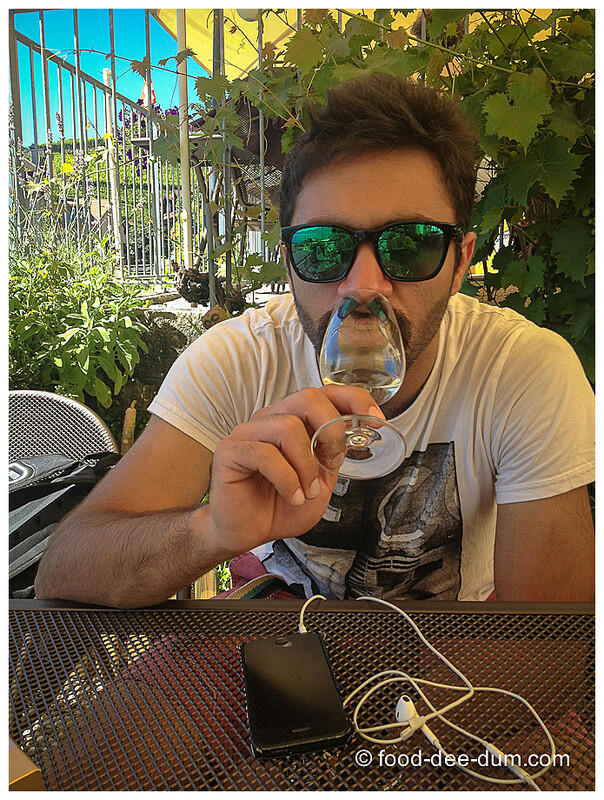 Most people don’t realise that Swiss wine is any good! According to the servers at the vineyard restaurant, the Swiss end up consuming most of their own production and very little is actually exported. Also, apparently they don’t make much of an effort to market their wine. But they make just a little more than they need in Switzerland and it works for them! 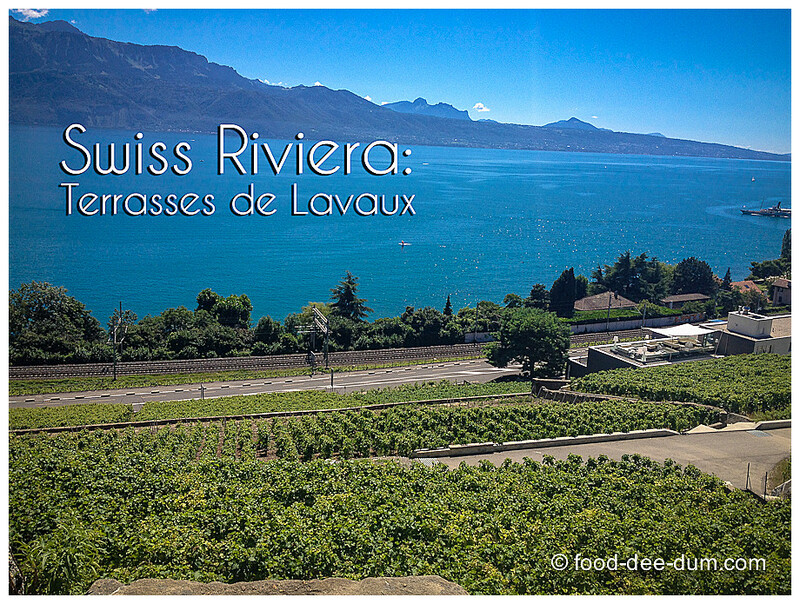 Lausanne is actually pretty close to the Riviera. 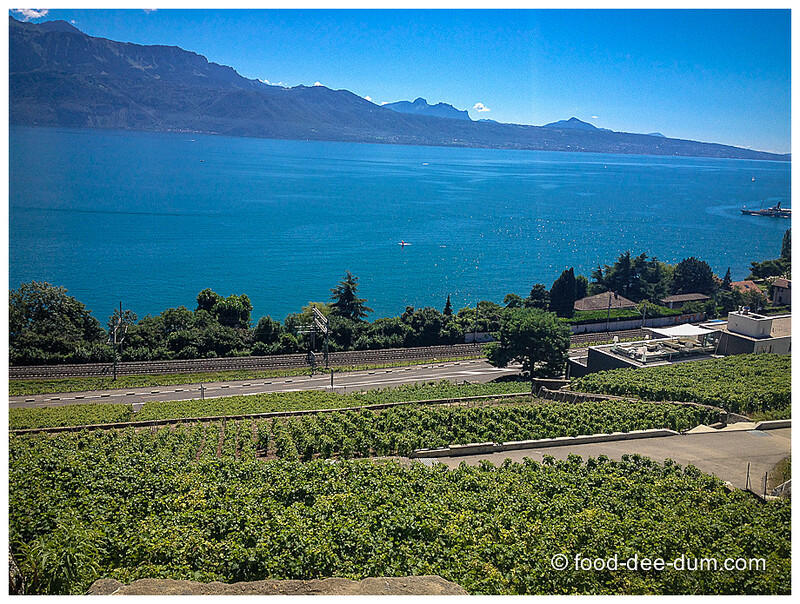 The Canton of Vaud (the state where Lausanne and Montreal are situated) is actually one of the larger wine producing regions in Switzerland. Montreaux, the jewel of the Riviera (and incidentally the place where Freddie Mercury spent his last days) is an hour’s train ride away or about 3 hours by ferry (on Lake Geneva). But we decided to skip this because we had already visit Montreaux in December ’12. 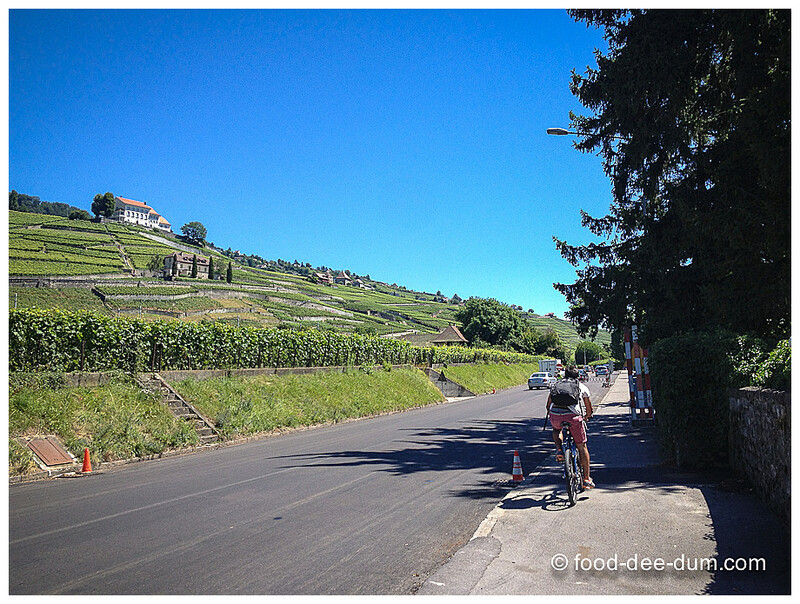 We decided to bicycle till the terraced vineyards of Lavaux, which I later realised are certified as UNESCO heritage, and were about 15 kms from Adit’s home. I was initially worried because Lausanne itself is kind of like San Francisco, terrain-wise, and there are a lot of uphill stretches! 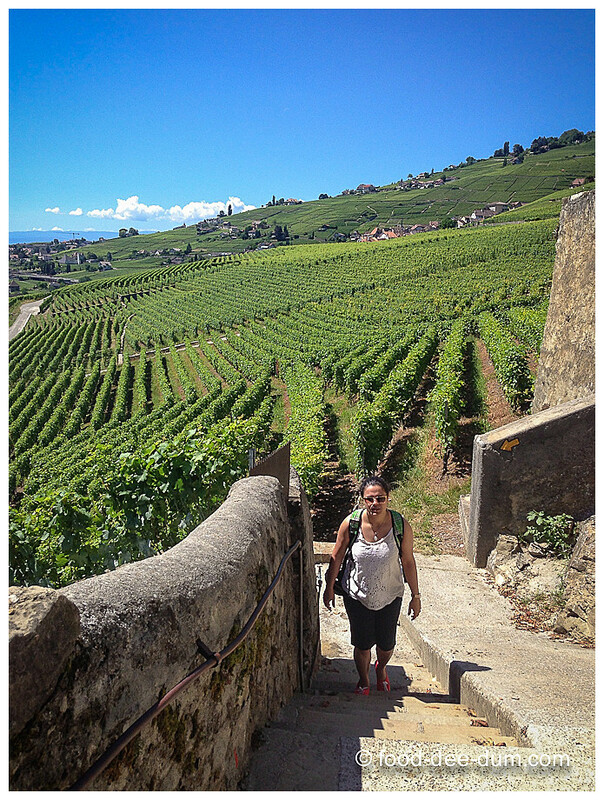 But we exit Lausanne downhill and rode along Lake Geneva (or Lac Leman as the Swiss call it), crossing the villages of Lutry, Villete and Cully, which are all in wine country, before we made our final stop at Lavaux. Taking a water+photo break just before entering the countryside. Crossing through Lutry — and yes, that’s Adit trying to take a video of me riding behind him. He likes the dangerous stuff! Also, we didn’t stop here because we were raring to get to the wine, but Adit says that Non Stop Lutry is an amazing burger place in this town! Aaaaaaand, finally, we’re in Wine Country! This was the most beautiful ride I ever done — Lake on my right and vineyards on my left. It was like this for kilometers. Parking our bikes at Hotel Lavaux (which was at road level), we started to hike up the stairs and slopes towards (what we thought were) the many wine-making families who would serve us endless glasses of wine! 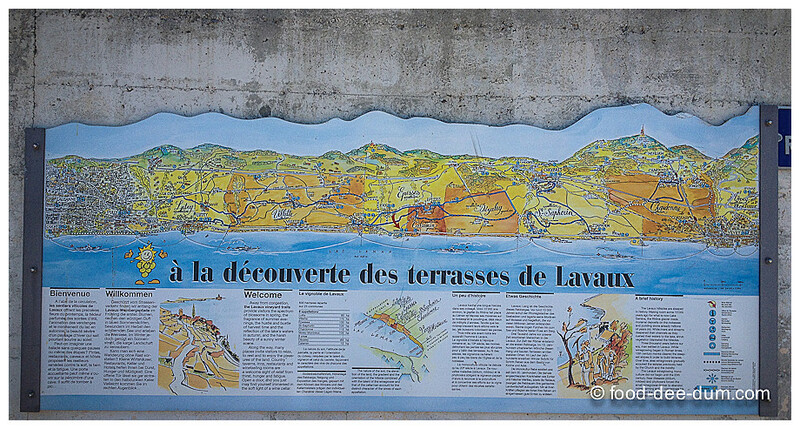 If you can zoom into this map, you can see the various wine-making villages within Lavaux. This was the view from halfway up! We were quite disappointed to know that all the wine-making homes at this time of the year are only open all day on the weekends. We went on a weekday so there would be only one of them opening from 4-6 pm. We had an hour to kill and had no choice but to go have a carafe of wine in the restaurant — open all day, 7 days a week — which we knew would be expensive! And it’s the only one – you can find it by walking around amidst the vineyard terraces and simply asking for “the restaurant”. It is right next to the municipal building and car park for the area. 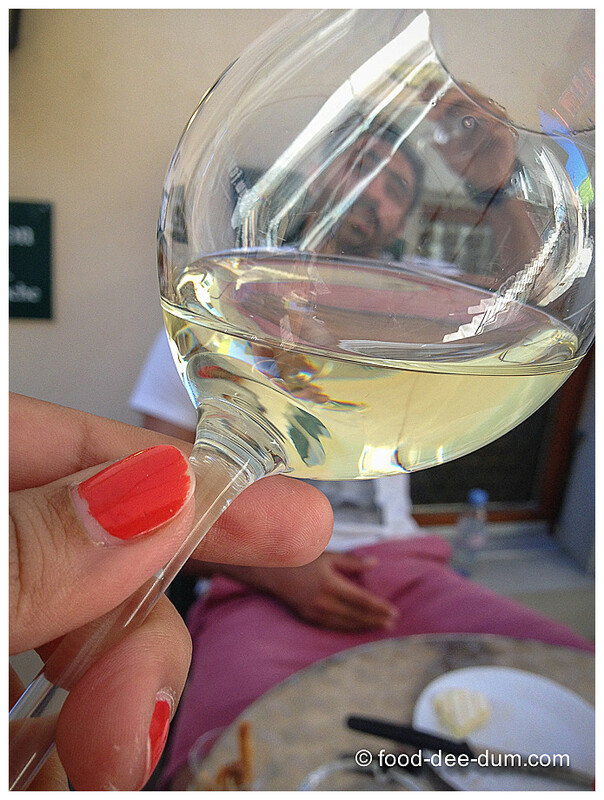 We had an (almost too) chatty French waiter who insisted on telling us how things worked so differently in the French vineyards! How nobody would dream of shutting down the vineyards to the public on any day — why would they, when they could have a constant inflow of visitors and money? 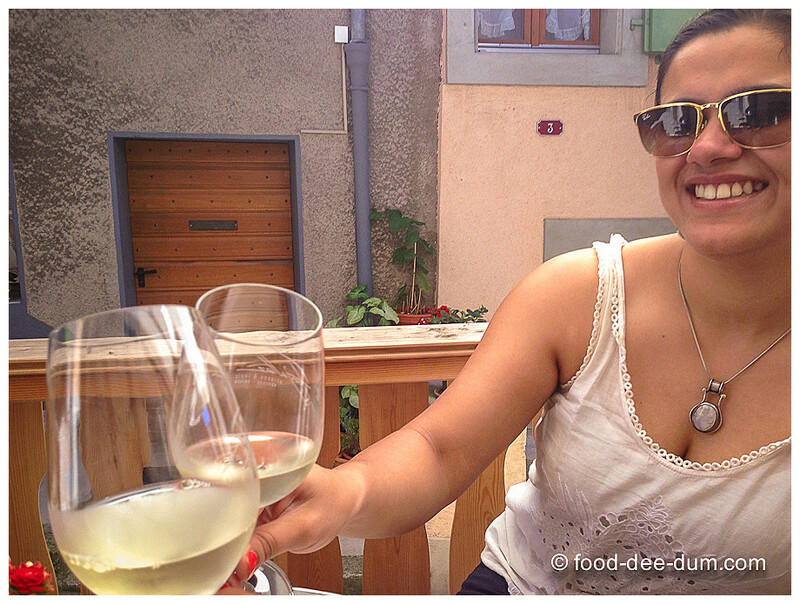 We picked a white wine – L’Embleme 2012 – and had a carafe while we killed time and enjoyed the gorgeous view! 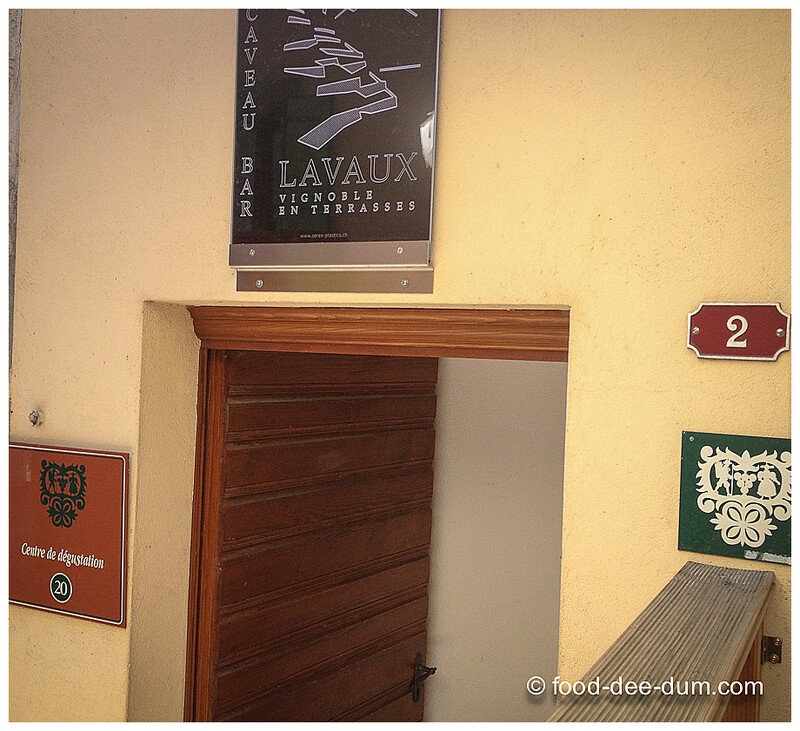 As soon as the clock struck 3:50 pm, we ran off to find the Caveau Bar & Centre de degustation at #20. It was just about opening for business and we had to wait a few minutes while they set up. It had a lovely wooden interior setting but the weather was lovely and we decided to sit on the terrace — which could essentially accommodate 2 tables for 2-3 people each. This is me struggling over the decision of where to sit, obviously before it was made! Here’s the view from where we finally sat, on the tiny terrace. 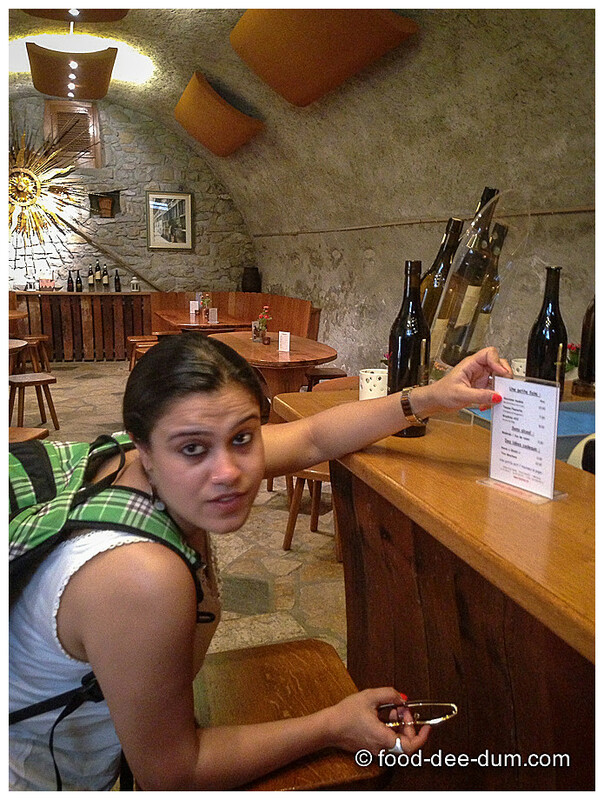 This is when we discovered that the wine-tasting here is not what we thought it to be! To try the wines, you have to order a glass (1 dl or 100 ml) and they will split it into 2 (or 3 or 4) tasting portions for you. In this way you can keep trying portions or find one you like and start ordering a full glass by yourself. So they operate more like wine bars than open-ended wine tasting for a fixed price. For a proper wine tasting, it is best to make a reservation at the wine-maker of your choice for a fixed list & menu tasting. We decided to stick with white again. We had already tried the L’Embleme 2012 at the restaurant so we sampled La Ronce 2012 & Les Gradins 2011 — followed it with a full glass each of La Ronce and I even bought a bottle to bring home — waiting in my bar cabinet for a special occasion. There are 3 items in the eats section that you can order — all specialties of the area and made locally. Sausages or 2 types of cheese — Gruyere or Tomme Fleurette — and everything comes with a side of fresh rustic bread. Since we planned to visit Gruyere in a few days, we tried the Tomme Fleurette and it was one of my favourites from the entire trip. Fresh, soft and creamy, it melts in your mouth! They will refill your bread basket if you ask (nicely) because you definitely need more bread for that big round of cheese! Thoroughly stuffed and a little tipsy, we said goodbye to the owner/ server and walked down the terrace, back to our bikes and began the slow ride back to Lausanne! The weather had been erratic on the few days before this trip and we were glad to have had a good day to be outdoors. If you are ever in the area and can hire/ borrow a bike, this is one day-trip that I would highly recommend. 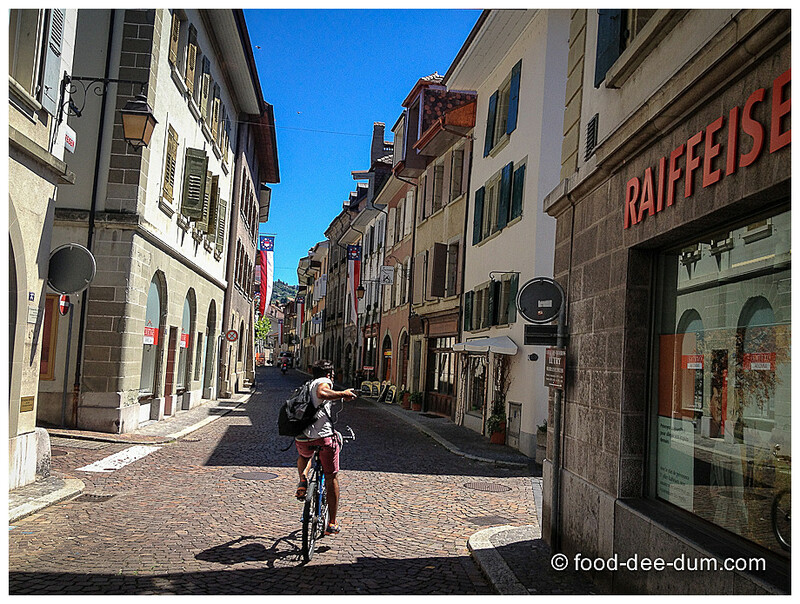 Cycle from Lausanne: the village of Cully (from where we started hiking up into the terrasses) is about 15 kms from Lausanne (assuming exit at Ouchy). The route is the same as the Lausanne-Montreaux route, just about half of the way. Apparently, people do this distance on foot too. If the weather is good and you’re adventurous, you could give it a try. There are trains which connect from every major Swiss city to Lausanne and (I believe) other from Lausanne to many of the Lavaux villages like Cully, Villette, Lutry, Epesses, Rivaz etc. but you will have to check the SBB (Swiss Railway) website/ phone app for more information. 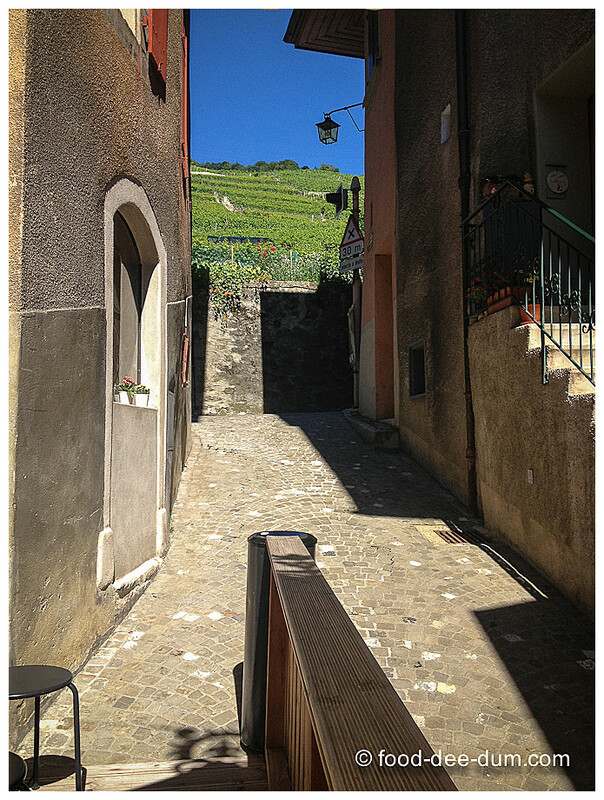 You may also want to look up a “vine train” called the Lavaux Express. 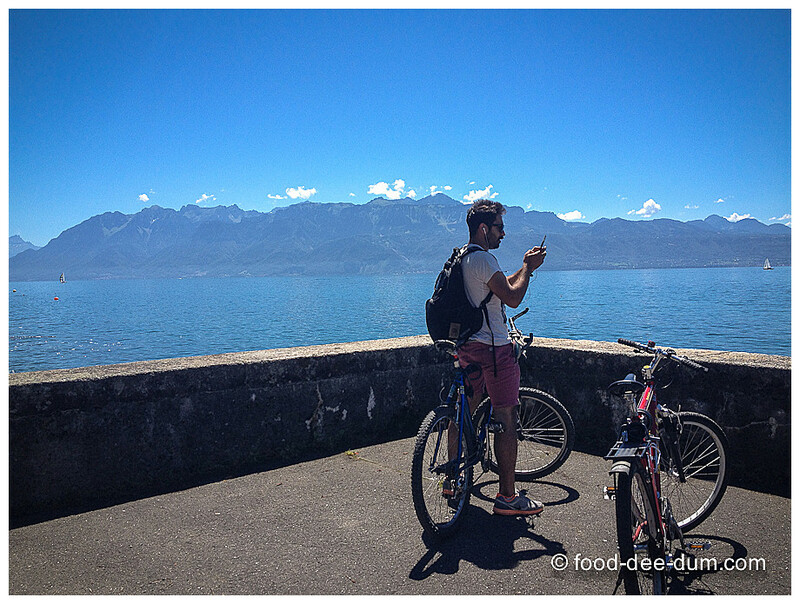 I also hear that the Ouchy (port in Lausanne) – Montreaux ferry stops at Lavaux, but you should check that on their website. The bikes were free because they were borrowed, but I believe bikes can easily be rented for around 10 CHF/ per day. 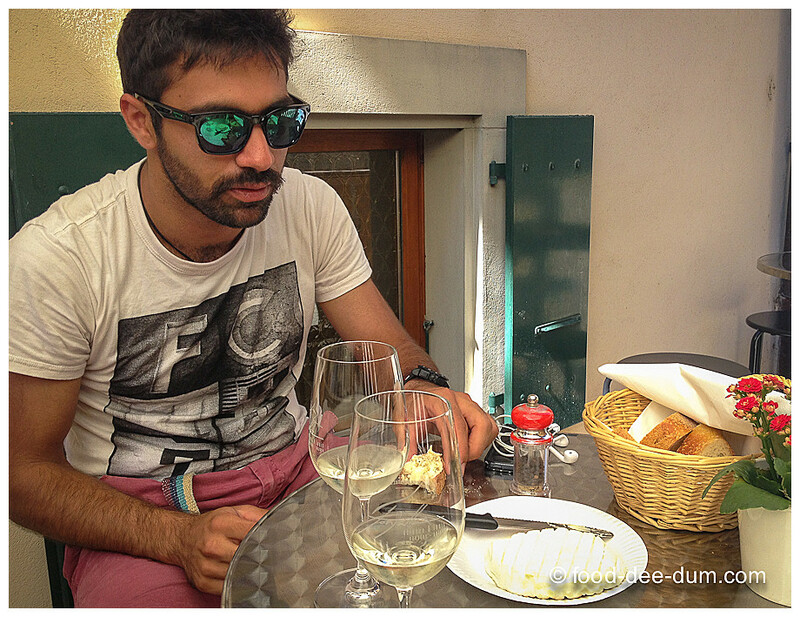 Around 30 CHF for 4 glasses (1 dl/ 100 ml each), 1 cheese and bread at the Centre de degustation. Additional 18 CHF for the bottle, which would cost me around 25-27 CHF back in the city.